“I have seen a valley suffused with mellow light beneath a lovely veil of morning mist . . .
scorching and exhausting it with its glare, and leaving it burnt up, sapless, and pitifully barren. Obermann, first published in 1804, is the best known work of French writer Étienne Pivert de Senancour. Usually described as an epistolary novel, the letters that constitute this volume are much closer to being a series of interlinked essays. Supposedly written by the melancholy recluse Obermann, whom critics have generally seen as a thinly disguised stand-in for Senancour himself, the letters contain the emotional outpourings of a man forever searching the depths of his innermost self in the hopes of overcoming his despair and finding a place for himself in the world, yet never quite succeeding. The letters cover a multitude of topics such as the hypocritical morals of the time, the failings of religion, the poor treatment of women in society, and the futility of existence. But while these writings are always overshadowed by an inescapable sense of brooding and pessimism, there are also passages that contain striking descriptions of Obermann’s Alpine refuge that are almost mystical in their sense of union with nature. The work is similar in some respects to Rousseau’s Reveries of the Solitary Walker, his Confessions, the Essays of Montaigne, and even to Thoreau’s Walden, yet it is wholly original in its form, and there is nothing else quite like it in the history of French literature. 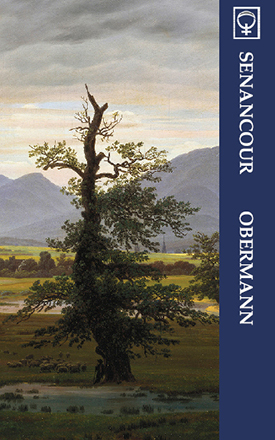 Though virtually unknown in America and largely forgotten in France, Obermann should nonetheless be seen as an essential text of early Romanticism whose rightful place is next to Goethe’s Sorrows of Young Werther and Chateaubriand’s René.